Some photos on this page are contributed by Scott Keller. 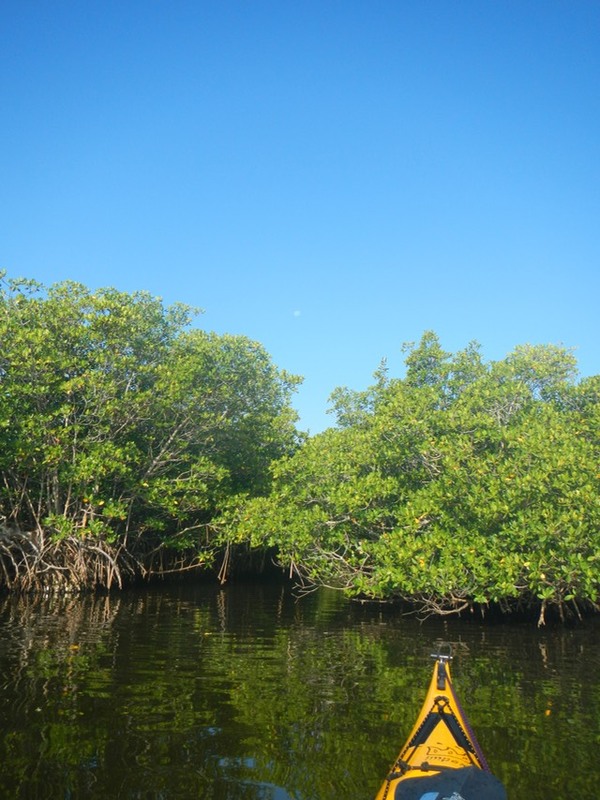 I found this mangrove tunnel while paddling on the Indian River Lagoon. Like most mangrove tunnels, it was pretty well hidden. It was not on my map or GPS unit, so I assumed it was mostly unknown and unexplored. When I entered the tunnel I didn't know if I could get through, if I would have to turn around or, worse, have to paddle backward to get out. I used my new deck cam to film the event. Surprisingly, I felt much more enclosed than the camera showed. There was barely enough space to dip my paddle in the water on each side of the boat, and in places there was not. You'll see me hold my paddle parallel to the length of the boat in places and duck low to the deck to get under branches. You might also notice me taking a swipe at some big spiderwebs, some with the host spider very much in evidence. In the end I got through, cutting across the middle of the mangrove island through the tunnel. I didn't mark the entrance or exit to the tunnel with my GPS, so I doubt I'll ever find it again.